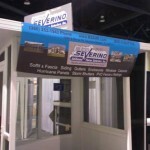 Screen, glass, acrylic, and vinyl enclosures – Budd Severino Advanced Home Exteriors, Inc. When the time comes to add that long awaited screen room on the back of the house, or if you are ready to enclose that existing screen room with glass or vinyl windows, there is only one name you should think of, Budd Severino Advanced Home Exteriors, Inc. We use only the highest grade aluminum extrusions to build our screen walls. Kick plate and chair rail are standard, however they may be eliminated if you choose. If your patio doesn’t already have a roof we can build one for you. We offer a choice of 12″ X .32″ pans or 3″ structural panel (walk-on) roof. All roof systems come standard with trim, gutter & downspouts. If you are looking to enclose an existing screen room, we offer you a choice of single-hung, horizontal rolling, or awning type glass windows, or 4-track vertical or horizontal sliding vinyl windows. We can even go as far as to insulate, panel and even supply electrical outlets around the perimeter of the room. Budd Severino Advanced Home Exteriors, Inc. is a certified general contractor. This gives us the ability to build any type of addition you may desire.